Wool tufting the Impreza WRX and Lexus LS400. You could be forgiven for thinking that it's an odd pairing: why aero test both the constant four-wheel drive WRX turbo hotshot and a big luxury V8 LS400 in the same story? The answer lies in the fact that both cars are three-box sedans - and it's this shape which often has a lot of aerodynamic problems. Last week we covered in a quick overview the idea that a small wake behind the car (ie leaving only a small amount of disturbed air) will usually reduce drag. Cars with sloping tails can achieve airflow that remains attached right to the trailing edge, but that's often not the case for booted sedans. Instead, on these cars, the flow often separates on the rear window, which is bad news for drag reduction. If the flow re-attaches on the boot lid, mostly fine - the wake remains small. But if the flow never gets back onto the car's upper surface, the disturbed air of the wake being dragged along behind the car will be large. And, from a performance application, if turbulence exists on the boot lid, the placing of a wing is also made more difficult. Why? Because a true wing won't work in air that is turbulent! This particular 1999 Impreza WRX has been fitted with a front spoiler extension and an STi-spec rear ring, which is taller than the standard item. (Thanks to Steve for making his car available.) And what did the wool tufts tell about the airflow? It's easy when you see the wool tufts in action to assume that the pattern that they're making is the same that they made when the car was still. However, as you can see here, that's definitely not the case. ...and with the car moving at 70-80 km/h. As can be seen, there is good attached flow across the bonnet of the car - something common on most cars. (If the flow were turbulent here, the amount of air passing into the intercooler scoop would be vastly less!) On the upper part of the guard, the flow is also good (the single tuft able to be seen crinkled has caught up on itself by a thread of wool). However, if you look closely, you can see something strange going on behind the intercooler scoop. And this closer look clearly shows that turbulence behind the scoop. Note also the attached flow across the (closed) bonnet exit vents - because of the presence of this type of flow, these vents would flow well when opened. However, they might then create areas of turbulence on the bonnet behind them, possibly decreasing the cabin ventilation intake pressure. ...as do the tufts around the rear vision mirror. Despite lots of publicity about aero-shaped mirrors, the flat shape required on their trailing face means that they create noticeable turbulence. 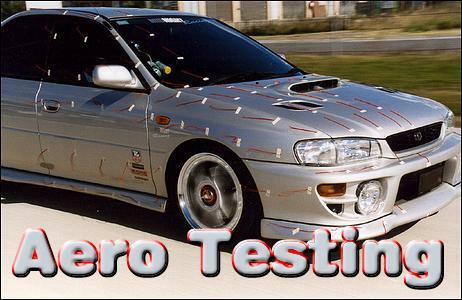 The front corner of the WRX shows good aero stories. There is no obvious turbulence (remember that tuft on the guard is stuck in that position) and the lip extension is nicely directing flow around the corner, even from airstreams quite low down. (The less air that goes under the car, generally the better.) Note also the three tufts showing flow through the radiator grilles. But what about at the back of the car? Here's where the action really starts! At a glance it can be seen that all the tufts on the vertical rear surface of the car are in turbulence - eg between the taillights, on the lower valance near the numberplate, and below the third brakelight. No surprises there: that's all gotta be in the wake. But even on the bumper behind the rear wheel things get uglier a bit quicker than expected - than curved-in-plan-view bumper has flow separation (clearer in some other pics) that starts almost immediately below the leading edge of the taillight. Hmm, and that rear window flow pattern looks a bit suspect, doesn't it? So does the airflow rejoin the car on the boot lid? If it does, the resulting drag penalty would be minimised and, further, a low wing would still work. It's a little hard to see, but it looks as if the air stays unattached right across the boot lid - some tufts can be seen whirling around in about the middle of the panel. However, what can also be seen is that there is attached airflow both sides of the tall wing - it's working fine. (Or, if it isn't, it's only because its shape is wrong, not its position.) So our guess is that a smoke stream along the car's centreline would leave the rear glass a little way down from the top and then pass beneath the wing, perhaps just re-attaching itself at the very trailing edge of the boot. This rear three-quarters artist's view best shows what's going on. This drawing was made based on all of the wool-tuft photos taken, including many not included in this story. Note the attached flows across most of the leading panels, with turbulence confined to three distinct areas: the (aftermarket) wheels, behind the rear vision mirror, and just behind the front wheel. The flow across the C-pillars and trailing edge of the roof is attached, but it separates only a very short way down the rear window, creating a major area of turbulence across the rear window and boot lid. However, the tall wing is sufficiently out of this turbulence to be in clean air, as can be seen by the attached flow across the aerofoil. The wake behind the WRX can therefore be estimated as being the full width of the car, with its height a little greater than the upper edge of the boot lid. The Lexus is also a three-box sedan, but it's one that's much bigger than the WRX. That makes the achieving of a low drag coefficient a much easier task - huh? Easier? Wouldn't the Cd be higher if the car is bigger? Nope - Cd refers just to the slipperiness of the shape, while it's the combined figure of Drag Coefficient multiplied by Frontal Area that determines the total drag. So while the CdA figure of the Lexus will be higher than a smaller car with the same Cd, there's no reason why the Cd itself should be higher. In fact, there's a good reason why it can be lower - a bigger car has more room to smooth the transitions in shape which can often cause flow separation. In fact, the LS400 has a quoted Cd of 0.28 - although that should be taken with a grain of salt, as should most manufacturer-derived drag coefficients. But in a car with its large frontal area, a top speed of around 245 km/h from only 190kW shows that the Cd must indeed be quite low. So, can we see by wool tufting what makes the Lexus slippery? Sure we can! Let's start off at the back of the car, since that's the area critical to low drag. Looking at the flow on the roof, it is clear that it is attached - the roof tufts are lining up nicely. However, part-way down the rear glass things aren't so good - there is turbulence, and the tuft in the centre at the base of the glass is obviously in unattached flow. Note also the tuft near to the bottom that is actually facing the wrong way - it's heading straight into what would be normally considered the airflow direction! In fact this shot shows the turbulence perfectly. But it also shows something else. Unlike the Subaru, on the Lexus the flow clearly reattaches on the boot lid - here it can be seen that the second and third tufts to the rear are back in attached flow. So the wake is being brought right down in size, despite that initial flow separation. Here the complete process can be seen occurring. Attached flow across the roof, separating part-way down the rear glass (it says attached around the C-pillar onto the rear window - I am referring here to the car's centreline). Re-attachment on the boot lid, then a fairly clean separation off that sharp edge formed in the trailing line of the boot lid. The wake size is therefore only the height of the boot lid multiplied by the rear width of the car. Finally, a clearer idea of the attachment down each side of the rear glass can be seen here - the separation bubble is confined to the middle of the rear window. This separation does increase drag though - the pressure recovery that would be gained by the airflow pressing on the glass is lost. This Dave Heinrich view makes it very clear. Along the centreline of the car the airflow detaches itself at the end of the roof but rejoins the car's body on the last half of the boot lid. The flow around the C pillar onto the rear window reduces the size of the separation bubble, helping to reduce the greater drag that would be created if the whole rear window were turbulent. The size of the wake is therefore relatively small. At the front of the Lexus it is also largely good - though again not perfect. Here attached flow can be seen everywhere and the stagnation point (zone of highest pressure on the front of the car) can be picked clearly by the tufts that go sideways rather than up-and-over or down-and-under. Hmm, but what's that happening just behind the front wheel? Doesn't look good! Here the turbulence behind the front wheel flared guard can be seen clearly. Note also the airflow across the wheel itself - distinctly better than in the WRX with its aftermarket open-spoke wheel design. We don't think that too many people will pick their wheels on the basis of the behaviour of the air passing across them, but it's interesting none the less. Of course this whole assessment ignores a vital area of airflow - under the car. And in the case of the Lexus quite a lot of under-car aerodynamic aids exist. In three-box cars (ie booted sedans) it is always the case that most of the action is around the back of the car - especially in the transition from roof to boot. Gently sloping rear windows will allow attached flow to be retained onto the boot lid, while C-pillars that are curved in plan-view will aid the flow of air from the side of the car onto the rear glass (and then down onto the boot lid). A clean exit from the top of the boot lid will reduce drag further, while boat-tailing (the car narrows at the rear in plan view) will also reduce the size of the wake if the sideflow remains attached. From a lift perspective, flows that wrap over those upper curves tend to create lift (the vast majority of sedans have a positive rear lift co-efficient, with advertised "downforce" improvements more often meaning "reduced lift"!). However, if the attached airflow can be retained on at least the trailing end of the boot lid, wings can be effectively used. Otherwise, a spoiler that disrupts the attached flow around those upper curves is a better bet. But either way, a very simple exercise of wool tufting can be used to open your eyes to at least some of what is going on. Next: the Porsche 993 turbo 4WD and New Beetle! Interested in do-it-yourself car aerodynamics? You�re sure then to be interested in the Amateur Car Aerodynamics Sourcebook, available now.